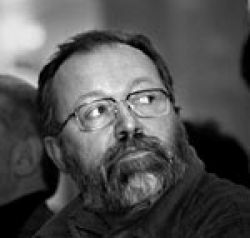 Quick Study: Andrei Dmitriev is a fiction writer and screenwriter who won two major Russian literary awards in 2012 for the novel The Peasant and the Teenager. The Dmitriev File: After fifteen years publishing short and medium-length fiction in Russian literary journals, Andrei Dmitriev’s first book, a collection of novellas and stories, came out in 1998. The Turn of the River, the book’s title piece, is a novella about a school for children with tuberculosis; it was a finalist for the 1996 Russian Booker prize. Dmitriev’s biggest literary breakthrough came in 2012, when he won the Russian Booker and the Yasnaya Polyana youth award for The Peasant and the Teenager, a book that details generational and geographical gaps in contemporary Russia. The Word on Dmitriev: In Russian Literature, 1995-2002: On the Threshold of the New Millennium, N.N. Shneidman sums up Dmitriev by calling him “an interesting writer. His plots are inventive and his language is simple, but his prose is intended for the intelligent reader. His aim is to tell touching stories about ordinary people who find themselves in pathetic situations.” Novelist and critic Maya Kucherskaya called Dmitriev’s novel The Peasant and the Teenager a poem and predicted that the book will someday be taught in schools, where “serious teachers” will likely explain to their students that the book depicts a clash between two worlds, the Russian village and the world of an infantile urban young man. On Writing: Dmitriev said in an interview with Vzgliad that he doesn’t consider himself a writer of Russian “village prose,” saying, “Village prose and prose about the village are different things. What’s known as village prose is based on a kind of myth. In this case, I mean myth not as lies but as a particular construction, a model of the world.” Dmitriev also says he believes village prose has faded away and transformed into a sort of xenophobia.